I had been there. In the exact spot. It was December 1958 and in a light snow, with a very crisp chill in the air. Only then, my feet were a size 6 boys and freezing like exposed chicken knuckles! At least now, my feet weren’t freezing. But the blood-laced-adrenaline-jitters were still there. And I loved it. 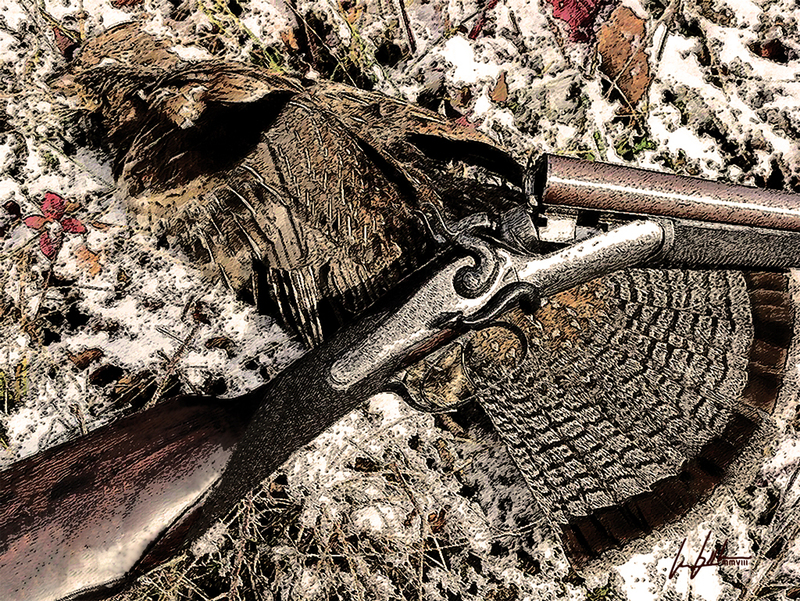 As I look down at the single ruffed grouse, posing in ‘la mort avec l’honneur’, alongside my dad’s old double-barrel shotgun, resting in the skiff of snow, I am launched back in time to my first grouse hunt on that cold December day in ’58. Dad came into my room well before light to wake me. But he didn’t need to, I’d hardly slept all night. He barely got the door opened when I popped out of bed like the 20 gauge shells from his old side-by-side. “Yes sir. Be right there.”, I replied, while jumping into my clothes. A few splashes of water on my face, brushed teeth and a token stroke of the comb and I was good-to-go. Mom was just finishing the pancakes, oatmeal, cold raw milk and coffee when I slid into my chair. “Say bud. Suppose we could get this ‘early rise and ready quick’ action to become a regular part of your morning ritual? Hmm?”, she said, smiling in front the more serious suggestion. I knew I was busted. So I tossed back a bit of humor hoping to get unhooked. “Well, I guess I could, if there was a hunting or fishing trip connected.” I attempted to slide that slick sales job by with a ‘cute kid grin’. I lost. Oh, well, who cared. I was heading out to hunt with dad. Breakfast is never better than those taken just before you head out afield or to the water with dad. Odd? The viewfinder on the camera fogged up just as I remembered that bit of history. As I waited for the fog to clear, I remembered back to those first few moments, right before that first grouse busted out of the cover. When I went with dad into the field, and there was a gun present, I quartered dad on his left side like a shadow. Dad stood a sturdy 6’1″ tall, packed into a lean 175 pound frame of all muscle and sinew. Grandpa, his dad, always told him – and me and my brother – that what we needed most was…’seasoning’. This was Grandpa’s way of telling you to get back to work and toughen up. I don’t believe Grandpa was much into fun. He was too busy being a drill sergeant in full-dress. As a result of many years of conditioning, dad was not easy to keep up with. But when we hunted in the woods, he was a lot easier to shadow. I was eager and he slowed down a bit. He enjoyed being in the woods and didn’t want to loose any time of it. A great combo that worked to keep me from a constant, “Hey, keep up!” reminder. I really enjoyed those times. Even more so now the older I get. Well, of all things, that eyepiece keeps fogging up. Gotta wait for it to clear again. Old Suzi, dad’s 10 year old Brittany spaniel, pushed ahead of us at a comfortable distance with her nose to the ground and one eye in the trees. She knew those birds sat in trees and she wasn’t about to let one get by her. It didn’t happen often either. I was a chatter box as a kid, but I knew to keep my comments, questions and musings to myself once we hit the trail. If I had a serious question, when I could get dad’s attention, he’d gladly answer it. But I just knew that I really didn’t want to over-use my ‘field access’. So I learned to compartmentalize the questions and formulate them into as few choice words I could ask, later on. A valuable lesson as I learned later on in life. As I was doing some of this ‘formulation’, meaning I wasn’t paying attention, dad pulled up in an abrupt stop. Yep! I ran right into his left hip pocket. He didn’t move but I bounced off. Dad looked over his shoulder with his finger to his lips, then reached down an helped me up. We had no sooner gotten regrouped when the grouse blasted from the bushes! That bird scared the holy-bejabbers outta me! That’s for sure. But dad… he just went into one of the prettiest ballet’s I’d ever witnessed to then … and possibly since. The grouse quartered left, dad was in full sight, swing and follow-through when he squeezed off the left barrel. I just happened to be in the perfect line to see the entire scene. Dad, in swing, squeeze-of-trigger, flight and crumple of the grouse and Suzi in her trademark, hind-leg hop-n-point! Just before dad would shoot, she’d look more like Trigger under Roy Rogers than a Brittany on point. Like it all happened seconds ago, I can still hear the sounds of the rustling leaves, the drum of the grouse’s wings, dads wool clothing rotating on his body, his feet making a bit of a rotation-friction squeak, then the click of the hammer – then the entire world was encompassed in the blast! Man! for a 20-gauge shotgun, that gun could really make noise. Well dogged! The viewfinder fogged up again. At this rate, I’ll never get this thing photographed. You know, I was surprised, when even through the racket, I never took my eye off that grouse. In mid flight, one moment it was heading out of sight, then it just crumpled and fell in a rocketing arc, hit the ground and scooted in and under the leaves. Before we could flinch, Suzi was already on the bird, mouthed it and was in return. I remember it was smaller than I’d thought. Beautiful. Soft. Limp. No longer flying. It was dead. Blasted camera lens! Fogged-up again. Must be the cold. Memories are like that. I’ve never forgotten it. I pray I never do. The Featured Image for this short story is a special treat. My good friend and colleague-in-collaboration, Trevor Hawkins, Illustrator Extraordinaire, from Warragul, Victoria, Australia, created this beauty for me to illustrate his enjoyment of this story. Trevor and I have only known each other for a few months, but we have grown to appreciate each others creativity, love of the outdoors and flare for the interesting side of life. Trevor posted a fine pen and ink rendering on his Facebook account (where we met BTW) of a gentile upland hunter in an uphill form. After making a couple of comments on the composition I asked if he’d ever read my short story, Ruff Double Memory and I left a link. He replied he had not but would. A couple of hours later I received a message asking if this was a collection of ‘my words’. I assured him they were genuinely mine and thanked him for his interest and compliment. 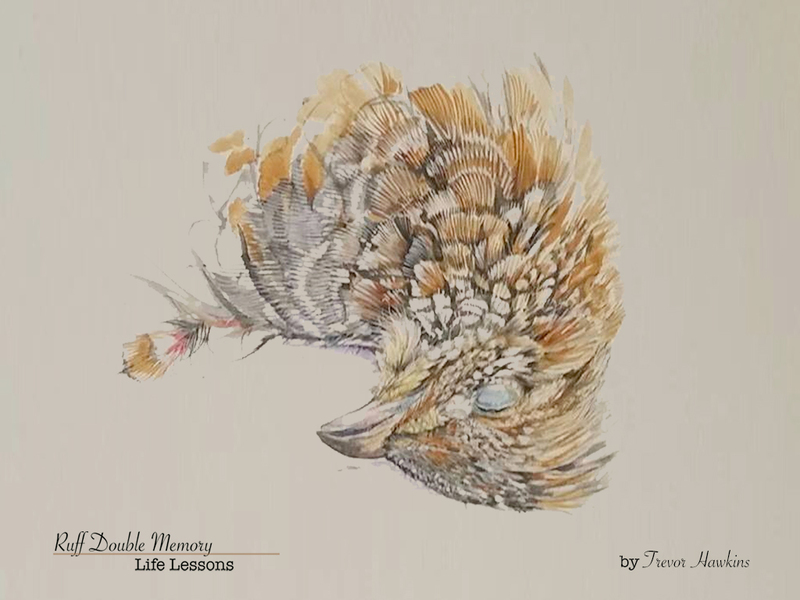 A few minutes later came a request to excerpt the father’s words to his son on hunting responsibility to go along with a painting he wanted to do, reflecting the sentiment. I was honored at the interest and request and bade him well in his journey. The next morning he posted this fine beauty that is the Featured Image here. I applied the name and artist’s identification. I believe Trevor and I will have several more such collaborations. I most certainly hope so. It has been quite enjoyable.